Jacob David was born between 1745 and 1749 during the exile of Jean Pierre David and Marie Magdelaine Monmellian from Louisbourg after the 1st siege of Fortress of Louisbourg in 1745. Virtually nothing is known of Jacob's date and place of birth at this time. According to the Fortress of Louisbourg Historical Memoranda Series 1964 to Present H F 25 1989 titled Jean Pierre David dit Saint Michel: Blacksmith authored by Eric Krause of Krause House Info-Research Solutions, Jean Pierre and Marie Magdelaine were still living at Louisbourg in 1744 along with their surviving children of "5 boys for certain, possibly 6 and 5 girls." These children would probably have included their 5 or 6 sons Jean Jacques, Jean Baptiste, Francois, Louis, Claude Thomas and Jacques Andre and their daughters Marie Josephe, Francoise Charlotte, Jeanne Olive, Marie Magdeleine and Jeanne Angelique. Michel, their oldest surviving son, had married Genevieve Hebert on 20 January 1744 in Grand-Pré, Acadie and was probably living there with his wife in 1744. This memoranda also states "In 1749, David returned to Louisbourg with 9 children and an orphan. Additional sons and daughters were: Joseph, Jacob and Anne Bernard (orphan)". However, it is believed that the Louisbourg 1749 - 1750 Census may have been misinterpreted and that Anne Bernard was not part of this family. 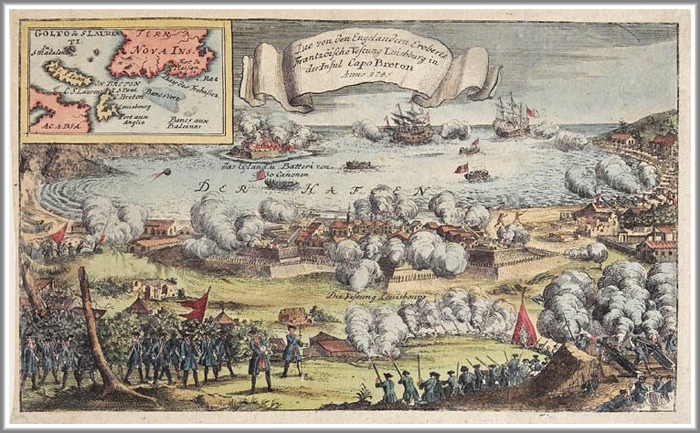 After the 1st siege and capture of the Fortress of Louisbourg on 16 June 1745 by British forces commanded by Sir William Pepperell during the War of the Austrian Succession, it is believed that Jean Pierre, Marie Magdelaine and their children left Louisbourg but it is not known if they were deported to France by the British with most of the other Louisbourg French and Acadian inhabitants or escaped to Acadie or one of the Quebec, Nouvelle France communities along the St. Lawrence River. Since it is recorded that there were 11 surviving children in 1744 at Louisbourg prior to the families deportation or escape from the Fortress in 1745, it is not known for certain which children accompanied Jean Pierre and Marie Magdelaine from Louisbourg since only 7 are recorded in the Louisbourg 1749-1750 Census along with the 2 new additions to the family, Joseph and Jacob. During this period between 1745 and 1749, it is unclear where 4 of Jean Pierre and Marie Magdelaine's children may have spent these years or if any had parished while in exile. It is highly likely that Michel was living in Grand-Pré, Acadie with his new wife, Genevieve. However, the whereabouts of Marie Josephe, Francois, Jacques Andre and Jeanne Angelique during this period are unknown. The Louisbourg 1749-1750 Census indicates that these 4 children were not living with Jean Pierre and Marie Magdelaine after they were repatriated to Louisbourg in 1749 from their exile. From later discovered source documents, we do know that Marie Josephe survived until 1758 and Jacques Andre was still living in 1763. As for Francois and Jeanne Angelique, how their life stories unfolded remains a mystery. No records of the David family's life between 1745 and 1749 has been yet uncovered after the 1st siege of the Fortress at Louisbourg by the British in 1745. The records of their lives pick up once again with the Louisbourg 1749-1750 Census and the marriage of Marie Josephe to Jean Paul Pouilly on 1 June 1751 at Louisbourg. During their exile from Louisbourg, Jean Pierre and Marie Magdelaine were not deterred from continuing to grow their family. For when the family returned to the Fortress in 1749, as mentioned above, they did so with 2 new boys, Joseph and Jacob. After Jean Pierre and Marie Magdelaine returned to Louisbourg in 1749, they did so with 9 children. According to the Louisbourg Census of 1749-1750, it appears that these 9 children living at home included Joseph, Jean Jacques, Jean Baptiste, Louis, Claude Thomas, Jacob, Francoise Charlotte, Jeanne Olive and Marie Magdeleine. 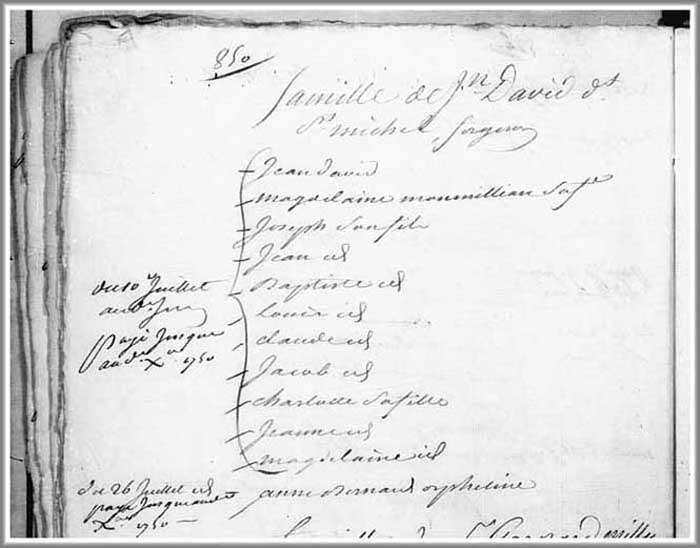 After the Louisbourg 1749 - 1750 Census, as indicated in the the primary source recording above, no other life event recordings has yet been uncovered which tells of the infant, adolescent and/or adult life of Jacob David. Jacob's documented presence in Louisbourg is not recorded in the secondary source Family Reconstitution File of his father, Jean Pierre David, which is archived at the Fortress of Louisbourg National Historic Site of Canada. This Family Reconstitution File was abstracted and compiled from original source documents archived at the Archives of Canadian and the Archives Nationale.